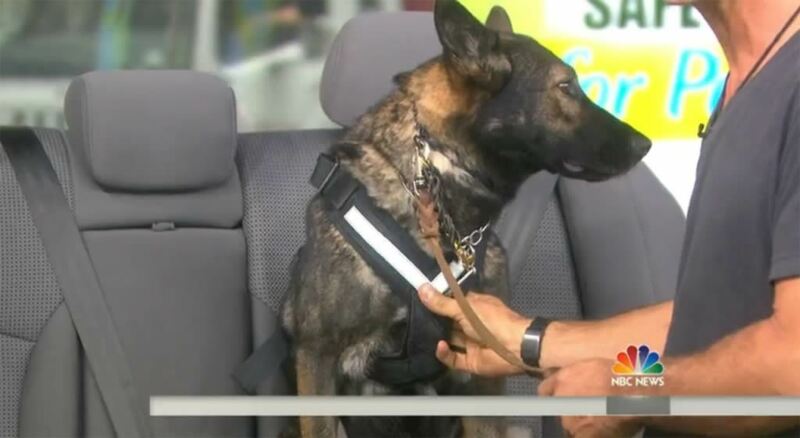 Robert Cabral appeared today on The Today Show with Kathie Lee and Hoda talking about the AllSafe Harness and Variocage. Have you ever wondered how to safely travel with your pet? In preparation for the upcoming Fourth of July holiday, celebrity dog trainer Robert Cabral discusses the correct way to travel with your pet using specific crash tested pet travel safety products. With the assistance of his dog Maya, Robert demonstrates the correct way to travel with your pet in the rear seat. The All Safe Harness by KleinnMetall is a crash tested, TUV approved pet harness with a 15 year track record of keeping both pets and human occupants safe. The All Safe Harness conveniently attaches to a vehicle’s safety restraint system, providing a secure and safe way to travel that keeps you and your loved ones protected in the event of an accident. The safest way to travel with your dog is with an MIM Safe Variocage by MIM Construction AB. The only dog crate tested for front, rear and rollover accidents, Variocage is designed and engineered to protect both pets and people. This steel cage features a built-in crumple zone to help it withstand the forces generated in an accident, keeping your dog secure and limiting the risk of injury to the vehicle’s other passengers. The Variocage also features a rear escape hatch to allow immediate access to your pet in the event that the rear hatch of the vehicle cannot be opened. The Variocage comes in many sizes, so there’s sure to be one to fit in your dog and your vehicle’s cargo area. – Each Variocage comes with a set of tie down straps that fix securely to your vehicles cargo hooks, keeping the cage safely in place up against your rear seat for optimum protection during travel. The Variocage comes in 4 varieties – Minimax, Compact, Single and Double. It is the only Dog Crate on the market built to meet government crash test safety standards. You can read more about the Variocage Safety and Testing here. Enter for a chance to win our FREE weekly Dog Toy Giveaway! Every week week we give away a FREE Dog Toy to a random person who is signed up to our Newsletter. You will then also be notified about new articles on Pet Safety, Pet Travel, News and much more.